Come and discover Versailles from a different angle! 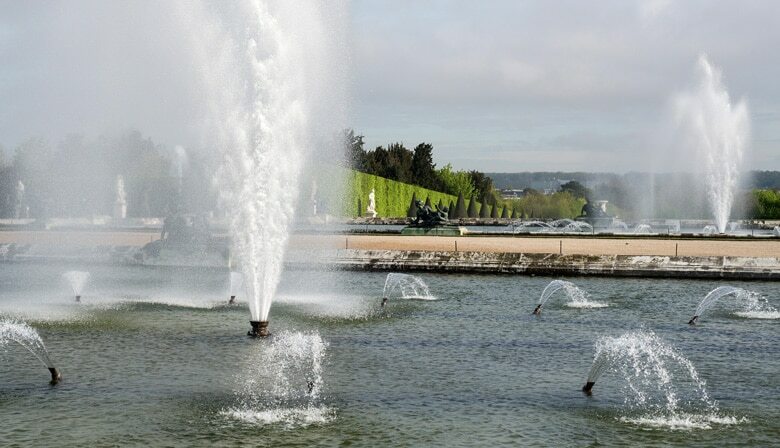 Visit the Palace and gardens with our guide and enjoy the magnificent Musical Fountains Show. The tour begins when you climb aboard our air-conditioned coach at our office in the heart of Paris. Discover the neighborhoods of western Paris before taking the highway to the Palace of Versailles. The trip takes around 45 minutes. During the drive, your guide will give you an initial overview of Versailles. The visit begins in the gardens designed by André Le Nôtre. Follow your guide through the groves and admire the famous Musical Fountains. Discover the fountains designed by the best in the field, including the famous Italian family, the Francinis, and the extraordinary sculptures brought to life by the Marsy brothers: the recently restored Latona Fountain, the Ballroom and rock garden, and the Apollo Fountain. The show is accompanied by baroque music, plunging you into the royal era of the Palace of Versailles. The tour continues with a guided visit through the Palace of Versailles. Priority access allows you to quickly gain entrance to the Palace. Your guide can show you the most beautiful rooms, including the Hercules and Mercury rooms — the latter features a bed and clock gifted to King Louis XIV — and the King’s chambers. You'll also have the chance to visit the must-see Hall of Mirrors. The majestic decor will blow you away! It was once used as a reception room, and features 350 mirrors and 17 windows overlooking the Palace’s magnificent gardens. You will be brought back and dropped off at our office in Paris at around 7 p.m. Welcome to Versailles, residence of 3 kings and 3 queens of France. Without delay, let’s discover the Royal Apartments. Through the half-open doors, let us imagine the private spaces, hidden love stories featuring past kings, queens and favorites...Let's follow the rhythm of the King’s day ... And when we’ll hear the message ‘Ladies, Gentlemen, the King is dead ! Long Live the King!’ there will be time for us to withdraw, on tiptoe, down the marble staircase and outside to get lost in the music of Lully and Rameau in the groves of the royal gardens. Well organized and stayed on time. We saw a great deal of the gardens and the palace. Our guide was very knowledgeable and friendly. Excellent tour with Roseanne, she was very knowledgable and had lots of stories about Versailles and the gardens which brought things to life for us. The time passed very quickly so I will take a full day trip the next time. Tour guide was very knowledgeable and friendly. Even with skip the line access, we still waited in a line for group entry.